At Ralph Brennan's Jazz Kitchen Express in Downtown Disney, my cousins and I shared a bag full beignets (ben-yays). They're basically fried dough heavily covered in powdered sugar. 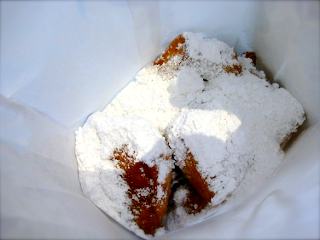 I really liked how these beignets were made compared to other fried dough desserts I've had! The pastries were kind of fluffy and not too thick. I'm getting hungry just thinking about it!